Shambhala meditation can help your enjoy running more as you can practice mindfulness and awareness while running. The word Shambhala is a Sanskrit word meaning “the place of tranquility.” Shambhala is believed to be a gentle and fearless society in which all its people have achieved enlightenment through the practice of mindful meditation and contemplation. In general terms, Shambhala can be interpreted as a kingdom of the mind and meditation practice in which all people, regardless of faith, can aspire to and achieve. Shambhala meditation and its teachings were inspired by the ancient, legendary society of the Kingdom of Shambhala. 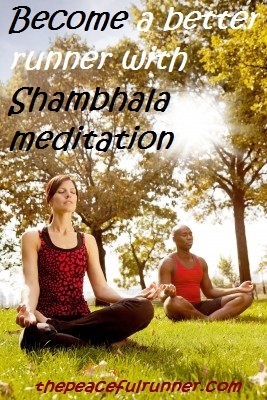 Shambhala International is a large global organization with over 170 centers and groups around the world who practice Shambhala Meditation together regularly. It was founded by Chogyam Trungpa Rinpoche, a Tibetan Buddhist teacher, in the early 1970s. The Shambhala, a secular organization, is currently directed by the founder’s son, Sakyong Mipham Rinpoche. "The Shambhala teachings are founded on the premise that there is a basic human wisdom that can help to solve the world's problems. This wisdom does not belong to any one culture or religion, nor does it come only from the West or the East. Rather it is a tradition of human warriorship that has existed in many cultures at many times throughout history." Sakyong Mipham Rinpoche is first of all a great spiritual teacher, but he is also an avid runner. He believes that it is important to build strength in both the mind and the body. When he first began to run, he discovered that he needed to apply similar principles to running that he did while practicing Shambhala Meditation. This seemed very natural to him as meditating is training the mind and running is training the body. To fully embrace the experience of running, it was necessary for him to bring the mind and body together as one. Sakyong Mipham Rinpoche has recently released his new book, Running with the Mind of Meditation: Lessons for Training Body and Mind . In this book he provides lessons for training the mind and body to live a more enhanced way of life with more energy, focus, patience, peace and contentment. Running and meditation are both natural, healthy activities. They help us relieve stress, relax, build strength, develop a positive attitude, stay in the present, rejuvenate, and deal with and alleviate pain. How we deal with pain is often how we deal with life. If we can learn to accept and develop better coping skills to physical discomfort, we will be better able to cope with the happenings in our lives and may be able to stay cheerful in spite of them. 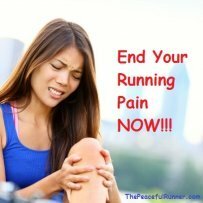 If we can lose our fear of pain, we will be able to let go of the tension in our bodies--the tension that creates injuries while running and stress in all situations. As you practice running and meditation, you will become more in tune with your body and how it moves. As body awareness increases, the risk of injury decreases. Your running form will also improve with attention and awareness. 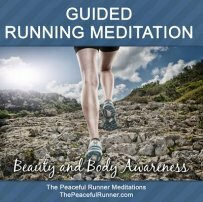 When you first begin running and meditating, a guided running meditation will help your develop your meditation skills and you will be on your way to becoming a happier and more peaceful runner. Your mind will become stronger and will help you overcome obstacles. 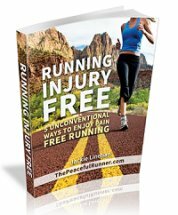 It will help you get through the physically challenging parts of running. You will become more aware of what you are thinking about while running and the effect it has on your running. Meditative running will help you enjoy running more as your strengthen your mind and your awareness. A breathing meditation is the most common form of all meditations including Shambhala Meditation. The breath is easier to feel during running, so it is a good opportunity to practice a breathing meditation. Try meditative running on your next run. Begin by setting an intention to let go of all thoughts and distractions. Stay in the immediate physical experience. Focus on your breath, each foot strike you make and the path in front of you. Acknowledge thoughts and return focus to your breath. Become aware of all sensations, thoughts and the environment that is all around you. Don’t try to shut out pain. Accept pain and breathe. Practice non-resistance and acceptance of what is. Go easy on yourself. As you develop more control of your thoughts, you be able to notice each thought and let it go. You will not become attached to what is not real. A stronger mind makes a better runner and a happier person.